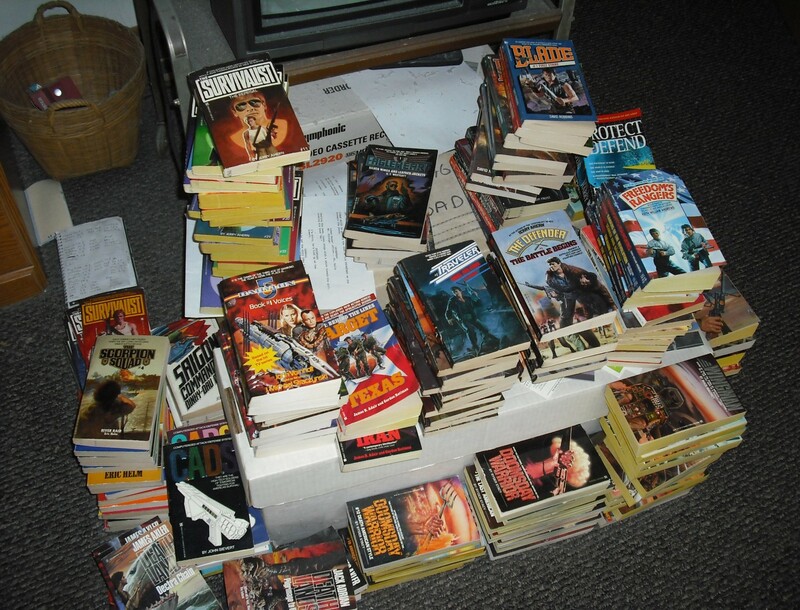 April 2014 – THE BOOKS THAT TIME FORGOT. We start with Gypsy in Marseilles continuing his quest for the mystery behind his identity. First he has to rescue his two friends Annabelle and Warpole. Annabelle is a prisoner of a bordello in Marseille and Warpole is captive of the Scavengers on the Cape Verde islands. The Scavengers are introduced as a group dedicated to collecting technology and people to rule the world. After successfully rescuing his friends the three head off to Africa. First stop is Ophir which is a sort of Disneyland of Africa. Joining a faux safari the three must battle a rogue robot gorilla and agents of the Scavengers. All the while Gypsy gets cryptic advice from the mysterious talking vulture. Finally at the country of Ngumi which is in the midst of a violent revolution, Gypsy discovers tantalizing glimpses into his past. Sadly this was the last of Gypsy’s quest. It seems that Gypsy was a fall guy for an assassination in 1978. 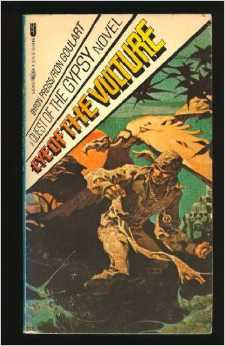 The Scavengers were set up as a powerful foe for Gypsy and the next stop sounded like South America. The series probably would have taken Gypsy around the world. A world that we will never get to see. So Gypsy, Warpole, Annabelle and the Vulture fade into history. We will never know the secret of Gypsy’s past. So be warned that the books were enjoyable reading but it is a disappointment that there will never be a satisfying resolution. In May of 1888 a young English lord and his wife leave on a diplomatic trip to Africa for the Colonial office. Unfortunately for them they chose a ship destined to never reach its intended destination. The brutality of the captain drives the crew to mutiny that results in the captain and his officers being killed. Luckily the young lord Greystoke had saved the live of the leader of the mutiny in a previous incident. Greystoke and his wife are spared and instead put ashore on the coast of Africa with supplies and their personal effects. The young couple built a small cabin and wait for rescue. The young lady Greystoke dies in childbirth and the father is killed by a tribe of great apes passing by. The young infant is saved by a young female ape that recently lost its baby. Kala adopts the orphaned infant and Tarzan meaning white skin in the ape language enters the tribe of Kerchak. Tarzan grows up to manhood learning how the survive the jungle. His human curiosity drives him to leave in search of his own kind. He discovers his parents cabin and teaches himself how to read and write from the child primer books. Eventually a ship comes to his lonely stretch of beach. Another group of people are marooned by a mutiny. A young beautiful woman is with the group. Tarzan rescues her from a rogue ape and they fall in love. Through a string of adventures the two are separated and Tarzan must eventually find his way to civilization. He learns the ways of civilized man and discovers that he is the true heir to the Greystoke estate. He eventually finds his love Jane in America but she is already engaged to be married to his cousin. So thus a legend is born. 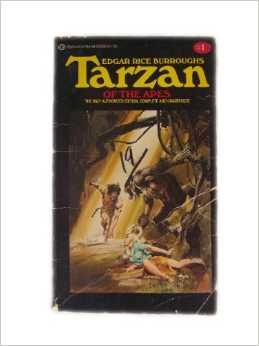 Tarzan is probably the most recognizable figure in fiction. It was definitely what made Mr. Burroughs famous. Many don’t know that Tarzan is not the mono syllable dullard that was portrayed in early movies. He is a very intelligent man teaching himself to read and write. The first language he learned to speak was French. The first of many languages. This was a solid start to the series. The story is fast paced and full of adventure and romance. Obviously the ending was a disappointment but that’s why a sequel was written which will be discussed in a future post. The year is 2033 and a man finds himself in Paris. The city is being torn apart by robots in the middle of one of their revolutions. The man has no memories after 1978. Luckily there is a talking vulture that can fill him in on current events. The vulture is cryptic in that he calls our hero Gypsy and he is part of some grand game. He tells Gypsy that he must go to London for answers. In London the city is suffering from a plague that only kills men. Gypsy rescues a rogue by the name of Walpole from the police so he has a guide. The first stop is an old hospital that Gypsy remembers. At the hospital he finds a group of women under Queen Bess are behind the plague. Using his new found powers of telekinesis and teleportation he defeats their plot to rid Britain of men. The clues he finds in the hospital point to Madrid as his next stop so Gypsy and his new companion Walpole are bound for Spain. Now Spain in 2033 is in pretty sad shape. Massive earthquakes and war with Portugal have devastated the country. A new religion called the Church of the Blessed Disaster controls the country. The church is fanatically anti-technology and keeps society in the dark ages. Our heroes come upon a public witch burning. The witch to be burned is Annabelle one of the women from London that Gypsy zapped with his teleportation powers. It appears that materializing out of thin air is grounds for witchcraft and being burned at the stake. Luckily for Annabelle Gypsy uses his powers to rescue her. After harrowing adventures the three escape from Madrid for their next destination Gibraltar. Gibraltar is inhabited by a peaceful settlement of farmers that inhabit the underground complex located there. After battling a robot left to guard the records, Gypsy arrives too late. The vulture has been able to burn most of the documents. What’s left is clues that his next stop is Geneva. After some more adventures with Moroccan raiders, Gypsy leaves Warpole and Annabelle for Switzerland. Now Geneva was basically destroyed and a new city Villedeux has been rebuilt over the ruins. The city was built by robots who have now taken total control over the humans in the city. The robots tell the inhabitants when to eat, sleep, dress and live. Gypsy hooks up with the local resistance and with his help overthrow the robots and free the humans. In the process he damages his arm and finds out that it is mechanical. The clues he finds out are that his next destination is Africa. So ends the first volume of the saga of Gypsy. 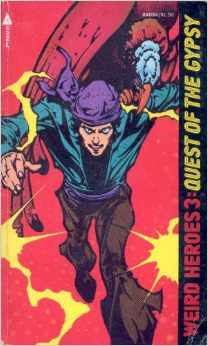 It was part of a series called Weird Heroes which was an attempt to revive the pulp fiction stories. Gypsy was supposed to be a six part series but unfortunately only two were published. I chose this book as my first review because it was the first book I ever read. I saw it for sale cheap and decided to buy it. I have to say that the story still holds up after thirty years. There are beautiful illustrations by Alex Nino throughout the book. I like the mystery of a man that finds himself fifty years in the future with no past memory. The world of 2033 is hinted at being destroyed by a combination of wars, revolutions and natural disasters. Its a plausible future that doesn’t feel dated even now. If there is one criticism of the story is that Gypsies abilities made it too easy for him to get out of danger. Still I enjoyed it and decided to buy the second book which will be for another review.